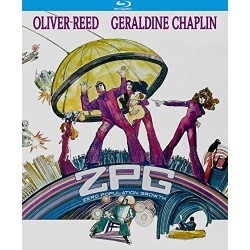 In the tradition of Logan's Run and Soylent Green - Oliver Reed (burnt Offerings) and Geraldine Chaplin (Doctor Zhivago) star in this dystopian vision of things to come. Under the weight of overpopulation, human society has begun to self-destruct. A policy of Zero Population Growth is upon citizens in hopes that twenty years without new births will right the sinking ship that is our planet. Couples are issued dolls to take the place of children, and neighbors are encouraged to speak out about any illicit breeding. Reed and Chaplin play a couple that decides to subvert the will of the government and have a child of their own, but need to hide their crime from big brother, baby-snatchers and even those they had trusted most. Co-written by Frank De Felitta (the Entity, Scissors) and Max Gordon (Bullitt) and Diane Cilento (The Wicker Man).